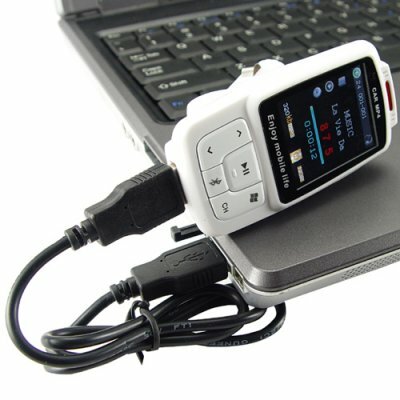 Successfully Added Car MP3 MP4 Player with FM Transmitter (White) to your Shopping Cart. Car MP3 MP4 player comes in a stylish white color. This is a convenient and cost effective way of listening to your favorite music whilst your driving. This model comes with a wireless FM transmitter. The CVHI-C16 is easy to use, plugs straight into your car's cigarette lighter charger and works straight out of the box. This model comes with an internal memory of 2GB, enough to fill it with hundreds of your media files. In addition, you can extend the use of the memory by inserting a TF card in to its external slide memory slot. This compact form factor MP3 & MP4 player will provide you with great sound quality on your journeys and best of all comes with a useful equalizer setting. This is a must have item for your car. The CVHI-C16 also makes a great gift for a friend or relative. Built and designed to provide maximum functionality and best user experience with the durability to last and keep on performing. This new car accessories item is in stock now and available to you direct from the leader in direct factory wholesale electronics, Chinavasion. Note: This product plays MP3 and WMA music files. Video files need to be in the AMV file format. We recommend using software from www.s1mp3.org or the tool "MP3 Player Utilities 4.10" to convert your existing video media files into AMV format files. Does this model come with on board speaker? No, you can hear the sound through the headset provided or your car's speaker system. Does the CVHI-C16 also comes with a TF card? No, but there is 2GB of internal memory that you can store hundreds of media file in. to date i have loaded one-third of the internal memory (2gb) of the car mp3 player with my favorite media files. it definitely works as it was program to perform. i am very satisfied. its really true it can contain hundreds of songs in such a small convenient gadget. it worksin the car, with ones laptop in the house, or where there is current to supply poer to the unit...outdoor with portable speaky orderers....anywhere. we played around by transmitting to any units that have fm frequency sync with the gadget. excellent stuff, more power to chinavasion staff for promply addressing my orders.highly recomendable to music enthusias on the road often. my view to this product is very Excellency.